This lithograph is taken from plate 11 of 'General Views of Lucknow' by Sir DS Dodgson. The Sikandar Bagh in Lucknow was built as a pleasure garden by Nawab Wajid Ali Shah (1847-56). Enclosed by a stout wall, it was named after one of his wives. In 1857, Indian rebel forces gathered there in great strength. 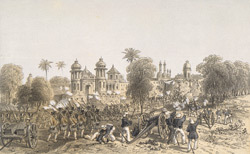 The British troops undertaking the first relief of the city under General Havelock managed to reach the Residency on September 25, but only after several sharp encounters with the guns at Sikander Bagh. As a result, they found that they could only add reinforcements to the besieged but not rescue them. The second relief force under Sir Colin Campbell moved from La Martiniere towards Sikander Bagh on November 16, and they were scarcely able to move because of the deadly firepower they faced. After heavy bombardment they created a small breach in the thick walls and went through. Both sides fought with desperate courage. At least 2,000 Indian rebels were killed.